Last month we were thrilled to welcome to thebestof Cloud9 Beauty Rooms, a place I visit regularly for a manicure. Abbey is my nail technician, she’s lovely and very patient with me as I agonise over which colour – it’s a big decision, I have the OPI gel nails colour and they last 3 weeks!! Over the Christmas holiday I treated my 11 year old to a visit to the salon. 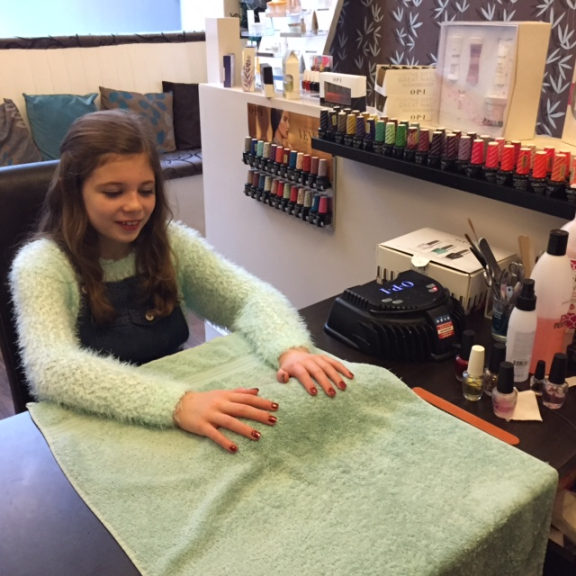 Like all little girls she loves nail varnish and regularly paints her own nails but a visit to the salon is about more than leaving with pretty nails, it’s the whole experience – as Ellie is now telling everyone,. “Helen trimmed my cuticles, shaped my nails, gave me a very relaxing hand massage and painted them a lovely red with a top coat of glitter! And mum had a cup of tea and a natter – it was so relaxing I can’t wait to go again”. What was nice for me was to spend some mother and daughter time with Ellie – especially as I had her full attention as she couldn’t tap away on her tablet or mobile phone! So if you know a little girl who would love a bit of pampering, or who’s fingers could do with a break from technology, book them a manicure at Cloud9 Beauty Rooms – they will love it.